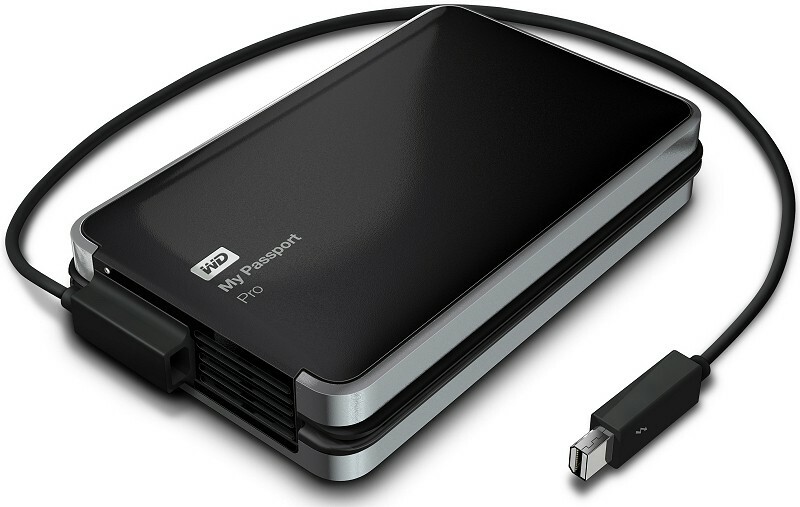 Western Digital recently introduced the My Passport Pro. The storage solutions company describes it as the first portable, Thunderbolt-powered dual-drive solution that operates without the need for an AC adapter or any extra cables. The My Passport Pro features dual 2.5-inch drives enclosed in an aluminum shell that has been thoroughly shock-tested for extra durability. The setup can be configured in either RAID0 or RAID1 for added speed or redundancy, respectively. Western Digital claims the drive clocks in at speeds up to 233 MB/s and when compared to a USB 3.0 drive, it can copy a 22GB high-definition video file twice as fast. It’s available in capacities of 2TB and 4TB but best yet, the enclosure is designed with the Thunderbolt cable built right in so you don’t have supply your own and you won’t have to worry about losing it. As outlined by Western Digital executive Jim Welsh, the drive is geared toward creative professionals – photographers, videographers, musicians, graphic designers, architects, etc. – that depend on portable storage for their livelihood. The drives have been designed for Mac as Thunderbolt hasn’t really taken off on PCs. They ship formatted for HFS+ J for OS Mavericks and Mountain Lion. Apple Time Machine has also been added for backup needs. Pricing starts at $299 for the 2TB drive and $429 for the larger 4TB model, both of which are available as of writing.